Why did the alphabet spell disaster for Walkers' Spell and Go? Scrabble players understand this only too well: some letters are worth more than others. Even Countdown viewers know that you need a good balance of vowels and consonants to make a decent word. 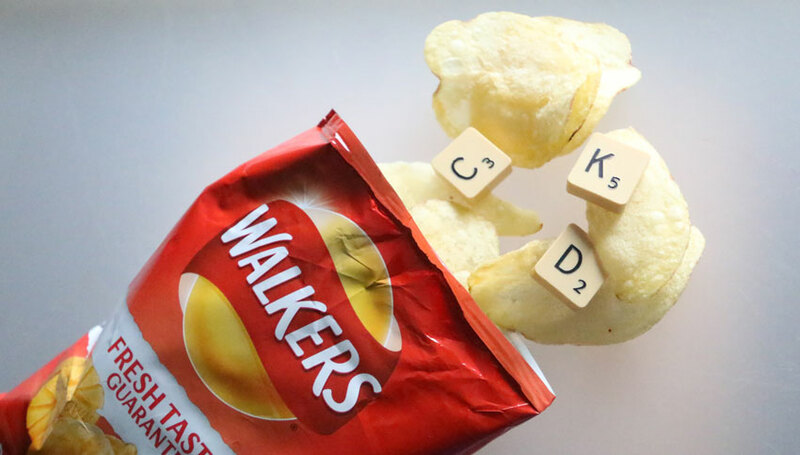 Recently fans of Walkers Crisps discovered that three particular letters – a C, a D, and a K – were unexpectedly valuable. These were the letters they needed (described as ‘Type-1′ letters in an ASA post mortem) to complete the name of a prize holiday destination in Walkers’ ‘Spell & Go’ sales promotion. Except that spelling T-O-K-Y-O, C-Y-P-R-U-S, or any one of the other 24 destinations turned out to be tougher than players thought. Those valuable Type-1 letters were in short supply. Experts estimated that you’d have to munch your way through 333,000 packets to be in with a chance of finding a letter K, the breakthrough letter for one of the long-haul destinations. Type-2 letters (all the others) were, in contrast, almost as common as the discarded crisp packets in your local park. Random letter generation – a one-in-26 chance? Walkers played on the Type-2 glut by inviting desperate collectors to exchange their spare letters in a random online swap (“you can swap any letter that you don’t need for a randomly generated letter”). Which would be fine if random really did mean random. It didn’t, and the company received a rap on the knuckles from the ASA for excluding Type-1 letters from its less-than-random generator. A possible explanation for the gap between expectation and reality is that the alphabet doesn’t lend itself to games of chance in which the odds of winning are low. To make it work, the winning letters have to be tightly controlled. For Spell & Go the chance of a free holiday was around one in 50,000 (20,000 holidays from something like a billion promotional packets). People understand low levels of chance – one in a thousand, one in a million, etc – when the odds are expressed in numbers. But how do they interpret chance in the context of an alphabet of just 26 letters? They know how it works when they dip their hand into the Scrabble bag. There’s a loaded but fair distribution of letters in which everyone has a chance of doing well. There may be only one Q, one X, and one Z, but you can still make plenty of decent words without them. In Spell & Go, however, you were going nowhere without a C, a D, or a K.
So what might crisp-eaters have been expecting when they revved-up their carb intake in pursuit of the alphabet? Did they really think that Walkers were generating letters randomly which would give them a K on average once every 26 packets? If it did work that way, they’d be boarding a flight to Tokyo after a single weekend of binge-eating. Perhaps they thought that letter distribution would match the distribution in everyday language. Since the letter K accounts for around 0.8% of an average body of text, collectors would have found one in every 125 packets of crisps. Scrabble’s inventor, Alfred Butts, spent hours analysing stories in the New York Times to establish the frequency of letter use in American English. His letter counts were pretty much spot-on, although he did tweak them to make the game more playable. Should Walkers have followed his example? Probably not. Although you can establish language-wide letter frequencies by analysing a mass of writing such as the British National Corpus, the distribution varies for specialist literatures. The frequency of the letter X, for example, should be higher in pharmaceutical journals (all those banalax-type drug names) than in daily newspapers. And higher again in websites that wear a triple-X rating as a badge of pride. Since the names of tourist destinations are anglicisations of foreign words, their letter distribution won’t match those of the language as a whole. There will be regional differences too. Asian and European place names are distinctly different. The only way to establish the letter frequencies within a specialist topic is to analyse its literature. Worthwhile if you want to make a word game out of it, but commercially disastrous for a sales promotion in which the aim is to hand out as few prizes as you can get away with.